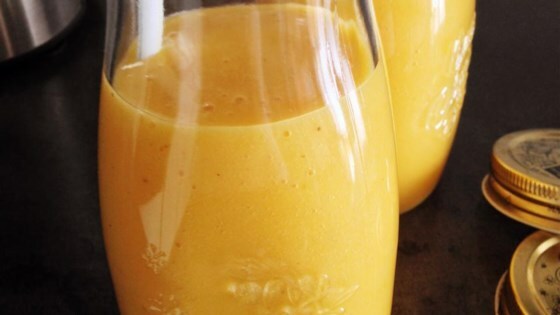 "Whip up a refreshing protein vanilla mango shake." Blend mango, yogurt, almond milk, ice, protein powder, and honey together in a blender until smooth. What a guilt free mid afternoon pick me up! I have shied away from protein powder because my DS uses it in nasty looking and smelling potions, but it is fine this way. Thanks, Lela! My kids said this was the best smoothie they've ever had. Thank you Lela!! Wonderful Smoothie, thanks Lela a keeper for sure.. I was just looking to make a mango smoothie without the protein, so I took out the protein powder and the smoothie still taste great! Nice balance of flavors. I used coconut yogurt.